The National Economic Council (NEC) on Tuesday approved a Tk 93,894.68 crore Revised Annual Development Programme (RADP) for the current fiscal year, including self-financed projects, down from the original ADP outlay of Tk 100996.92 crore apparently due to the slow pace in implementation. Prime Minister Sheikh Hasina presided over the meeting held at the NEC conference room in the city's Sher-e-Bangla Nagar area. The overall RADP size is Tk 7,102.24 crore lower than the original ADP size. Briefing reporters after the meeting, Planning Minister AHM Mustafa Kamal said that of the overall RADP outlay of Tk 93894.68 crore, the government would provide Tk 64,734.68 crore while the remaining Tk 29,160 crore would come from project assistance. Besides, the revised allocation for the organization's own fund has been downsized to Tk 2,894 crore. An official at the Planning Ministry told UNB that initially Tk 88,000 crore was proposed at the NEC meeting for the RADP, excluding the self-financed projects for the current fiscal year. 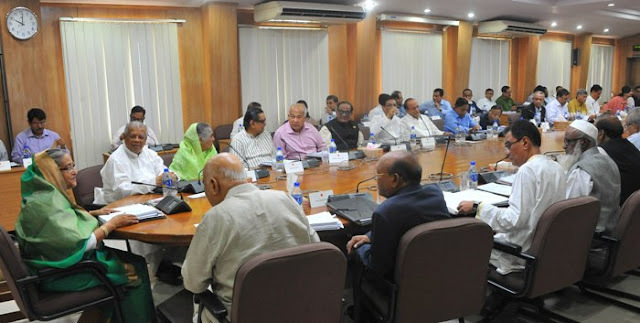 But due to the demand of allocations from various ministries, Prime Minister Sheikh Hasina raised the allocation by another Tk 3,000 crore to be borne from the government exchequer. The final amount was reached adding the Tk 2,894 crore from organization’s own fund. He also informed that this increased amount would be later distributed among the ministries and divisions which seek more fund. The planning ministry in an extended meeting last month finalized the outlay of the revised ADP which was placed in Tuesday's meeting of the National Economic Council (NEC). About the RADP, the Planning Minister said that most of the ministries and divisions sought additional allocation in the RADP as they were very much hopeful of implementing those. He said that there is a need for enhancing the implementing capacity by the project executing agencies as the size of the ADP would be increased more in the coming days. Side-by-side there is also a need for more resource mobilization. He also informed that the investment-to-GDP ratio also increased to 29.68 percent in the current fiscal, up from 28.99 percent from the previous fiscal year. Earlier, the size of the ADP for the current fiscal year was set at around Tk 100,997 crore including Tk 3,996.92 crore self-financed projects. As per the approved RADP, the transport sector received the highest allocation in RADP followed by power sector in second, and education and religion in third place. They are followed by the physical planning, water supply and housing sector in fourth, rural development and rural institution fifth, agriculture in sixth, and health, nutrition, population and family welfare in seventh. The current ADP consists of 1,215 projects under 53 ministries and divisions. Replying to a question, AHM Mustafa Kamal said that some 277 development projects are expected to be completed by this fiscal year. Meanwhile, according to the Implementation Monitoring and Evaluation Division (IMED) of the planning ministry, the ADP implementation rate including that of self financed projects, during the first nine months (July-March) of the current fiscal (FY16) reached only 41 percent with an overall expenditure of Tk 41,888 crore. The implementation rate is two percent less than the July-March period of the last fiscal year. Replying to another question, the Planning Minister said the expenditure during this July-March period has almost doubled over the last five years although the implementation rate is a bit lower than the previous fiscal year. 0 Response to "NEC approves Tk 93,895 crore RADP on back of creeping implementation in FY16"